What an edifying day this was for us and many others who joined us. We experienced the power of God moving through us as we preached the gospel with boldness, compassion, and love. One of our most recent events took place at the Chinese American Bible Church in Freehold, NJ. There we had the opportunity to train other brethren in biblical evangelism through our free Biblically Evangelism Training Seminars (Crash Courses). It was great! Many members of the church felt equipped as they grew even more in their understanding of the gospel. We even did some mock witnessing to prepare us before we went out to preach the gospel. 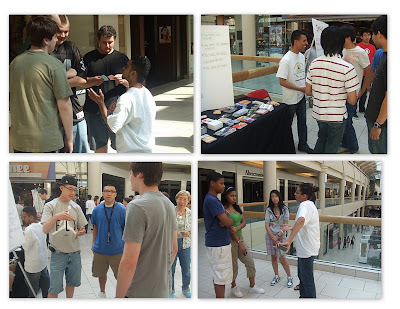 After training, we preached the gospel in a local mall. Tons of people from the mall gathered around the tables to take an intelligence test created by members from the Chinese American Bible Church. This drew many people, given us the opportunity to preach the gospel. By the end of the day, many people heard the gospel and our hearts were filled with so much joy because the power of God was moving through each and every one of us!